While online research has become the "go to" solution for all searches, that does not always work for complicated immigration matters, notes Magdalena Cuprys. Nowadays many people think that Google with give them the answer as soon as they type the question into the Google search bar. That may be true of you are looking for the closest hamburger restaurant, or where to buy new shoes. If it comes to immigration law, however, Google will probably not answer that question that easily. The reasons are manifold. Many immigration matters, such as USCIS instruction forms, are not searchable with Google (see below), you actually have to read them. The more obvious reason is that, after Tax Law, Immigration Law is the most complicated area of law. I have not counted, but the laws, regulations and commentary allegedly cover more than 10,000 printed pages. Be that as it may, we can all agree on the fact and that visa and immigration matters are very complex. But let us start with research basics. Conducting research is always an extremely difficult and time-consuming process. Not only must one double check facts and figures from a number of different sources, but it’s imperative for you to also ensure that your sources are credible and that you do not support misinformation or flimsy entities through your research. Even though the invention and widespread use of the internet has made research far easier than it was in the past with all sorts of information available at the click of a button, most people forget the fact that this convenience also comes with a price to pay. Additionally, since most people are worried about legal research costing an arm and a leg, it’s still possible for people to conduct research on legal matters using the internet – that too without paying a penny! Interested in learning all about how you can conduct legal research over the internet without spending a fortune? Read on to find out as we tell you all about some of the best tips and tricks that you could use to conduct legal research over the internet for free. Especially with online research, chances are that one has already done part of the research for you. As for immigration, a great starting point is Georgetown University, the Immigration Law (U.S.) Research Guide of Georgetown University Law Center (http://guides.ll.georgetown.edu/ImmigrationLaw). It contains not only federal statutes and regulations, but also administrative documents (which are very important since this a federal (meaning nation-wide) matter. Especially administrative adjudications can differ in different areas or regions. However, even a well-organized online library might not give you the answers you are looking. Thus, let us review other information sources. The United States Citizenship and Immigration Services is an agency of the U.S. Department of Homeland Security that administers the country's naturalization and immigration system. In case you are interested in the agency itself, Wikipedia is a great starting point (https://en.wikipedia.org/wiki/United_States_Citizenship_and_Immigration_Services). The website of USCIS provides a surprising amount of useful information. Thus, if your research issue is related to something that is under the jurisdiction of USCIS (such as an I-130 family-based immigration petition), the USCIS website www.USCIS.gov is a great starting point. The website has a help feature called “Ask Emma” in the upper right-hand corner. However, before you do that, try this simple short-cut to answers: The instruction sheets that come with most immigration forms. For example, if your issue is (again) related to an I-130 family-based immigration matter, you go to the “Forms” section of the website, and then select the “Instructions” sheet that is listed there along with the I-130 form itself. This is something that you cannot google, yet it is so simple to find and it may just answer your question. If you have a more complicated issue that cannot simply be answered with instructions, read on. Since you might need access to dockets and could want to review case documents to extract relevant information, portals and platforms have been created to help you find exactly what you’re looking for. In addition to the Public Access to Court Electronic Records (PACER), you could also resort to RECAP, a docket site which allows you to view millions of federal dockets for bankruptcy, criminal, and civil courts of the United States – all for free! Finally, here is one online source that is generally not very reliable – online forums. People talk a lot when the day is long, and many people post immigration and visa questions in these online forums, and get answers from people who “have heard from a friend that …” or something like that. Make sure to take whatever you read in an online discussion forum with a grain of salt. 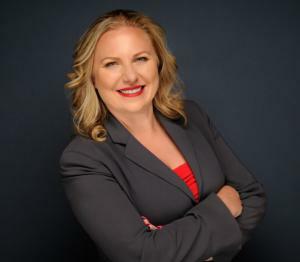 In the end, if you have a personal immigration or visa issues, it may be worth seeing an immigration attorney before you spend too much and effort on something that may turn out to be wrong. USCIS is merciless if it comes to rules. When you use the wrong USCIS application form, or send it to the wrong USCIS office, or fail to comply with regulatory requirements, USCIS will simple send the entire documents back to you. 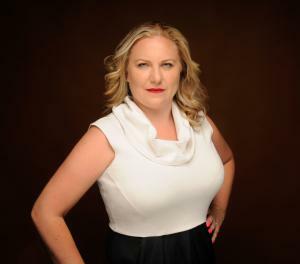 Make sure you have done your “right” research before you act, advises Ms. Cuprys. 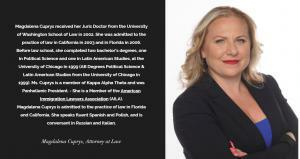 Magdalena Ewa Cuprys is the principal attorney of Serving Immigrants, a full-service immigration law firm offering a complete range of immigration services to both businesses and individuals. 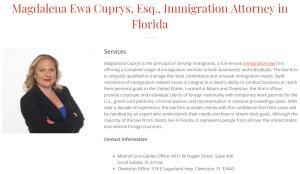 Located in Miami and Clewiston, the firm’s offices provide corporate and individual clients of foreign nationality with temporary work permits for the U.S., green card petitions, criminal waivers and representation in removal proceedings cases.